SEO is an acronym that stands for Search Engine Optimization. It is a complex series processes on the front and back ends of your website - along with marketing and content creation - that help your website be discovered by search engines. Do we really need to explain this? Everybody uses search engines to find information on the internet - price comparisons, articles, how-to's and more. When you enter a search term, or query, the search engine uses an ever-adapting and complicated algorithm to return what they think are the most appropriate and useful results. The search “engines” that people use to find information are essential because they return prioritized results for users. They first use crawlers (spiders) to explore the web, then they record everything they find in databases (or indexes). When you perform a search, the engine is actually returning results from its index rather than the live internet. Ultimately, SEO is about coding your information for search engines and making it accessible or discoverable by their crawlers. Their goal is to provide the most resourceful information to visitors when they need it. In order to do that, we have to understand SEO, changes in search algorithms, publishing and how it all works conjunction with each other. Many businesses believe that SEO strategies do not apply to them. Either they see it as too complicated, or they think their brick-and-mortar or small business won't see any tangible benefit from search engines. Both are untrue. SEO helps your business in many ways and is an essential tool in your marketing and outreach efforts. Even if a customer is frequents your business and knows your name, they are more likely to search for you rather than remember your domain. At the very least, then, you’ll want to make sure searchers can find your site when they’re looking for you. If you provide valuable information and make it easy for search engines to find and organize it, they will reward you with higher rankings. This increased exposure means more visitors to your pages. As with most marketing, you want to get your content in front of as many eyeballs as you can. Especially when your audience wants what you have, and SEO is a great tool for targeting. Since search engines return results to users who are actively searching for a particular term or phrase, getting to the top of that stack means you’re providing information to the people who want it most, when they want it. Unlike advertising, you aren’t trying to push information in front of people who might not be interested at the time. So, you have an active audience, and you don’t have to pay to get the message to them. Overall, search engine optimization is one of the most effective and sustainable ways to build your online presence. Rather than seeing it as something to “fix” after you’ve created content, keep SEO top of mind from the beginning. By following best practices at the start, you’ll create interesting, useful content that potential customers want (or need) to read. Then, the search engines will be happy to put you in front of a larger audience. Why Can’t Google Find My Business? Why Can't Google Find My Business? According to a recent Forbes article on small businesses, research demonstrates that smaller businesses, by and large, are not maximizing the benefit of their Internet presence. This may be surprising to hear, and even disappointing to some, but it should be pointed out that those taking advantage of it, are really experiencing significant gains. So, why can't Google find your business? Why aren't you showing up in searches? Rust Creative's SEO Division will explain how to get discovered on search engines. Title Tags: This is the title of your pages or post, and the first piece of information Google collects to “read” it. Meta Content: This is the brief snippet that appears on search engine results pages and further describes your page or post to search engines. Your meta content will include your title tag, your description, and schema data for indexing. There is even more schema data you should consider including if you review products on a blog, write news articles, or sell products. Each piece of meta content is relevant to the purpose of your website and should not be ignored. URL: The URL is the unique address for each page or post. These should have trailing URLS that are user-friendly to remember. If any of your web urls end in ".html" or ".php" you will experience issues. When people search for products and services, they commonly type in [industry, product, service] + [their city or town]. If your website does not make your business’s location known to search engines, you’re likely to be buried down the search rankings. It will also throw your website into the larger industry bucket, rather than your local area, making it even harder to rank. Your website is needs to be responsive or mobile-friendly. Google loves to provide websites to users that are easy to use and meet their needs. If your website crashes, loads slowly, or functions poorly on mobile devices, Google will want to hide it to protect its users from a poor experience. A good web design company or SEO agency will test your design across all popular browsers, making adjustments accordingly. Having a working website is not enough (and purely subjective). Users need to be able to move around on it easily and intuitively. Google can detect poor navigation structure through its users’ behavior. Make sure your website is optimized for seamless navigation and longer engagement. Otherwise it will get buried under competitors’ websites that are more user-friendly. Each page on your website should target a different keyword, and the keywords should be placed into the body of the page naturally. If you can’t find your website when you type relevant search terms into Google, make sure the page associated with that keyword has accurate, up-to-date, useful information. The keywords that you should use are ones that your customers are going to be most likely to look for. To find this, it’s best to put yourself in the shoes of your customer and figure out what they would search for based on their priorities and experiences. Careful though, keyword stuffing worked in the past but will not get you blacklisted! Main Street Kent hosted the annual “Seven Courses of Kent” dinner party in downtown Kent at Treno Ristorante, an upscale Italian restaurant situated in the historical train depot overlooking the Cuyahoga River. Guests enjoyed a delectable seven-course meal comprised of dishes from seven Kent eateries. Each course was paired with a beer or wine selection chosen by a representative of Heidelberg Distributing Company. All-inclusive tickets included the seven-course dinner complete with wine and beer pairings, tax and gratuity. This event was generously sponsored by Instantwhip Foods, Inc., Portage Community Bank, and Heidelberg Distributing Company. All food was donated by our generous business owners, and event proceeds benefited Main Street Kent. Guests enjoyed a variety of soup, salad, hors d’oeuvre, entrée and dessert courses from these seven Kent establishments: Burnside Barbecue, Franklin Hotel Bar, Lucci's Place, NINETEEN10, Twisted Meltz, Popped!, Treno Ristorante. It’s a great opportunity to indulge in some of Kent’s best cuisine, all in one night! Commercial photo studio specializing in food photography for local and national brands, restaurants, chefs, cookbooks, lifestyle and food-related subjects. We can shoot in studio, on location, and travel/lifestyle photography. We know our way around a kitchen, so we’ll stay out of the way, or, better yet, we can prepare your meals in-house and shoot them from our studio, provided you supply us with a recipe. Tired of over-styled food photos? Us too. Our minimal approach to food styling lets the food speak for itself. Our recipe for food photography success is as follows: 1/4c Jackson Pollock, 1/2tbs Francis Mallman, seasoned with natural light and a dash of Daido Moriyama. Who also love food photography! We could all say that we have a long history with food. We need it, after all, to survive. Our founder, Roger Hoover, began life watching his grandfather, Charles, turn flour, a few eggs, and water into divine kluski noodles. The alchemy of cooking has always intrigued him. It was his grandfather too who inspired Roger’s brother, Josef, to become a chef. In all, there are three chefs in our founder’s family alone. It was only natural that Hoover combined his fine art education with his love for food and became a food photographer. CTRL Eyewear is a new brand of smart wearables aiming to change the landscape of the wearables industry. CTRL Eyewear is specifically founded to create the consumer version of innovative eyewear created for the U.S. Special Forces. CTRL is established in 2015 in the Netherlands as a subsidiary of AlphaMicron Inc, Kent Ohio, USA. CTRL Eyewear aims to design, develop and market the world’s most innovative eyewear, powered by AlphaMicron’s vast experience in adaptive military lens technology. 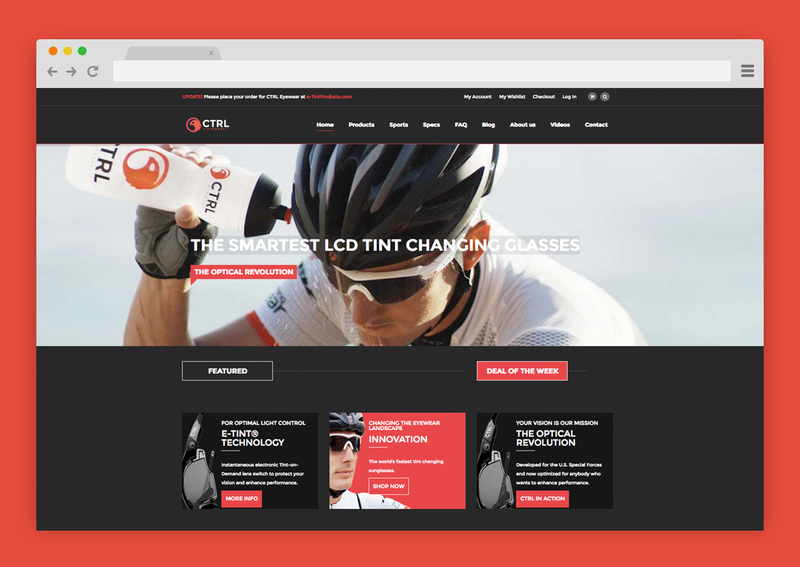 CTRL Eyewear approached us shortly after the company changed ownership. They wanted to migrate entire website under a new company name. Doing so posed many problems. First, there had to be no loss of SEO, emails, or sales during the process. The criteria for the job was twofold: We had to design and develop an ecommerce website quickly, and set up a Customer Support center for users and the CTRL sales team. We start every project with research. What is the market? Who does it consist of? What markets could we develop that aren't currently being acknowledged? How do we do that? Magic sorcery. We knew immediately that CTRL's product line was sleek, minimal, and technologically impressive. We didn't want the user interface or design of the website to interfere with strong product photography or video. So, we decided on a minimal grid system and limited color palette. We would use this approach for all digital and print design. Because CTRL is an international company with many storage facilities, we needed to streamline the ecommerce experience. Instead of sourcing a different website based on location, we moved all of the shipping and purchasing options into the hands of the consumer. One website, one experience, all managed from the backend of the website. The sales team requested a detailed customer RMA form. The functionality included a form with multiple questions that - once filled out by a customer - would be auto-fed into an XML spreadsheet that logged the answers to the questions, generated a unique return number, auto-saved as a PDF, sent an automatic notification to both customer and the CTRL sales/support team. The Speedbumps are an indie rock band from the great state of Ohio. Americana-UK calls their carefully orchestrated music "wistful acoustic Folk pop" led by the soulful and rootsy crooner, Erik Urycki. Because their songs are filled with intelligent lyrics underneath complex instrumentation, the band has won Relix Magazine's JAMOFF!, earned an IMA Award, and received Best Band recognition more than once within their region. Rust Creative develops tour poster concepts and social media marketing materials for the Speedbumps. We derive design concepts and marketing material by listening the the band's release, then design posters and cover images from those concepts. Rust Creative has worked continuously with the Speedbumps on concert posters, promo, advertising, and t-shirt designs.